Albeit peanuts are one of the most popular foods all over the world, only few people know that they don’t belong in the family of nut. In fact, this wonderful source of protein belongs to the legume family, which also includes lentils and beans. Peanuts are famous household consumption. People eat them in many forms – from whole nuts, peanut butter, peanut oil for cooking to boiled or dry roasted nuts. Should you eat as much peanut as you want without having any negative health impact? This article will shed light on if peanuts are really bad for you. Good news to all peanuts lover – Peanuts are certainly not bad for you. On the contrary, they provide many health benefits, as long as you eat them in moderation. They are packed with essential nutrients that your body needs. Several studies have also shown that including peanuts in your diet can significantly lower your risk of many diseases. Don’t underestimate this food just because of its size. Despite being small, it is packed with many nutrients that are essential for your health. Peanuts are actually one of the most cardio-protective whole foods that is popularly enjoyed and consumed. It is also evident that people who frequently eat peanuts have lower risk of heart disease compared to those that don’t. You lower your heart disease in half by eating a handful of peanuts five or more times a week. Even consuming peanuts twice a week will lower your heart disease risk by 24%. Whole peanuts, peanut oil and peanut butter are high in polyunsaturated and heart-healthy monounsaturated fats. These fats keep “good” cholesterol high while lowers “bad” LDL cholesterol. Are peanuts bad for you? Definitely not. We need protein in order for the cells in our body to be replaced and repaired. Proteins are responsible for the regeneration of healthy cells and repair of damaged cells. These essential nutrients also help your body build and maintain hair, muscles, organs, skin and other body tissue. Reaching for a bag of peanuts is a healthy alternative. A 1-cup serving of peanuts contain 38 grams of protein, so proteins derived from peanuts can meet the protein needs of protein deficient individuals, children and vegetarians. According to the University of Florida, peanuts rival many fruits when it comes to its antioxidant property. Not only do they contain helpful antioxidants, but they are also packed with good fats. Different varieties of peanuts have the ability to block the aging effect of free radicals that damage the living cells of our body and cause stroke, heart diseases and some cancer. Peanuts are also a good source of vitamin E which is recognized as antioxidants. If you want to get as much antioxidant that you can from peanuts, simply roast them while leaving the skins on. Peanuts are not called as nutrient powerhouse for nothing. They contain more than 30 essential nutrients and phytonutrients. If this does not impress you, I don’t know what will. These nutritional facts should remove all your doubts "are peanuts bad for you". One fourth cup of peanuts has 35% manganese, a mineral that plays an important role in carbohydrate and fat metabolism, blood sugar regulation and calcium absorption. One ounce of dry peanuts contains 101 mg phosphorus, 187 mg potassium, 50mg magnesium, 15 mg calcium, 2mg sodium, .64 mg iron, .94mg zinc, 2.1mcg selenium, .190mg copper, etc. 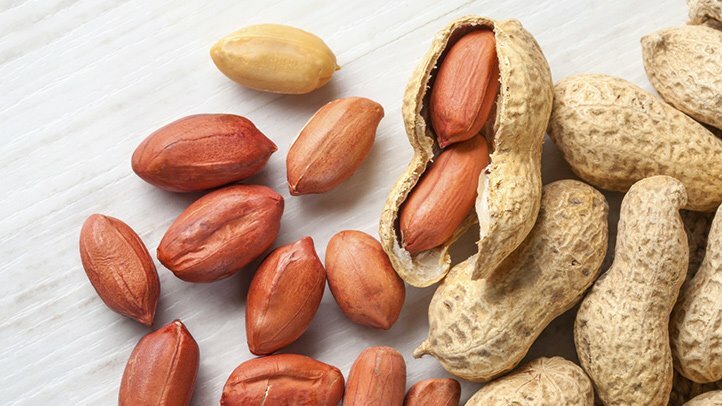 Peanuts in whatever form they are in are filled with vitamins and minerals that are important for our growth, metabolism, development and immunity. Niacin – converts food to energy. One ounce of peanut provides a quarter of niacin. Folate – important in pregnancy and infancy. One ounce of peanut provides over 10% of our daily needs for folate. Pantothenic acid – critical in metabolism and synthesis of proteins, carbohydrates and fats. Thiamin (B1) – essential for the functioning of muscles, heart and nervous system. Riboflain (B2) – plays an important role in metabolizing carbohydrates, fats and proteins. Choline – important in memory development of infants and functioning of lungs. Vitamin B6 – plays a role in immune and nervous system and involved in the metabolism of protein and red blood cell. Are peanuts bad for you? Generally not, however, there is some minor percentage of population that has allergy or negative effect when they eat peanuts. Always have a look out for these possible side effects. Peanuts are vulnerable to toxins and contaminants. Peanuts are susceptible to toxins such as aflatoxin and salmonella because of their soft and permeable pod. They also grow underground and with the nature of its pod, they are susceptible to moisture and warm humidity that promotes the growth of molds. They are one of the most common sources of food allergy. Peanuts rank high when it comes to most common food allergies for human. Some people have allergies that are severe that even eating a small portion or breathing air contaminated with small amount of peanut dust can cause life-threatening anaphylaxis. Lectins, found in many foods including legumes, are sticky product which serves as primitive pest-resisting strategy in a plant. They are hard to digest and can lead to inflammation and immune response as they bind to sugar cells in your body. Peanuts are pro-inflammatory because of its lectin content. Aside from that, they also contain high level of omega-6 fatty acids. In order to achieve good health, you need a balanced level of omega-3 and omega-6 fatty acids. Most farmers use fungicides and pesticides on peanut crops because peanuts are susceptible to molds. Non-organic peanuts and peanut products may contain high levels of pesticides residue. With many side effects of peanuts, keep in mind that no matter how good some things are, they should be eaten in moderation.